As part of my on-going domain informatics coverage, I am now publishing some additional information that I’ve been able to gather in the last few days. 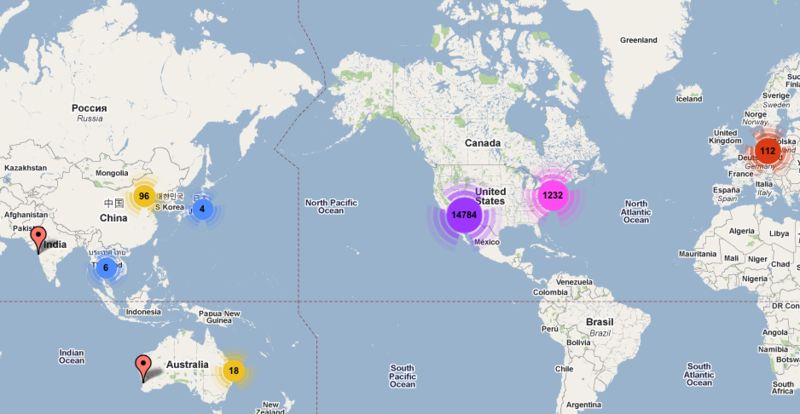 I am making available two additional geographic chats that breakdown the domain distribution by top world cities. The first chart a preview of which can been below (click to see full, browse-able/zoomable version) shows the Top 150 cities, by domain distribution. These cities represent a total 91.3% of some 102 million domains that could be resolved to a city level. The most popular city in the world, with 26.4 million domains calling it home is Scottsdale, Arizona in United States. Which is not entirely surprising, given that it is the hometown on GoDaddy, world’s largest domain provider/hosting company. This coincidentally means that Arizona, which had won the US state domain count contest with 26.7 million domains in our previous round of statistics, is entirely due to GoDaddy. The 2nd largest city is San Francisco, with a respectable 14.3 million domains, which represents over 1/2 of the 24.3 million domains hosted in California. And the 3rd place goes to Houston, Texas with just shy of 6.1 million domains. Overall there are only 15 cities in the world that can claim to host over a 1 million domains and all of them are found in the US. The first non-US city is actually Toronto, Canada at #19 with 850 thousand domains, shortly followed by Beijing China with 845 thousand domains. The smallest city on the Top 150 list is Oklahoma (Capital of Oklahoma, US) with just 43.4 thousand domains. Seems tiny compared to the beginning of the list, but on global country scale it would actually make it into Top 50 at 49, with almost twice as many domains as Iran (23.4 thousand domains) that would now be displaced to 50th place. To give a slightly better domain concentration view, I am publishing a dynamic cluster map that groups cities together by geographic proximities. Zooming in on the map will breakdown the larger clusters into smaller eventually, eventually resolving all the way to the individual cities. 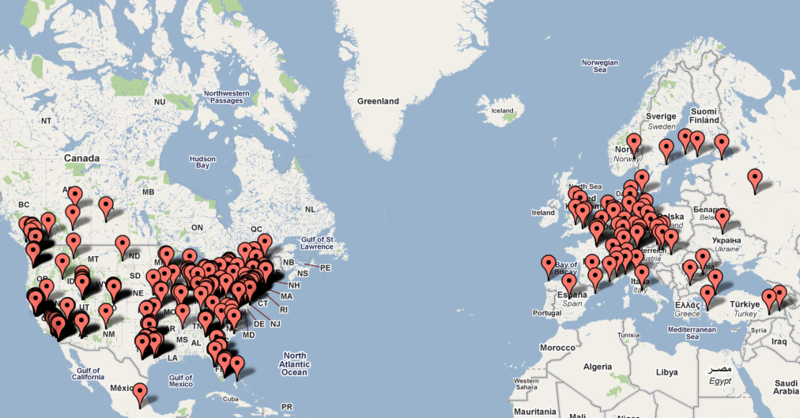 Due to better visualization of markers on this map, I’ve expanded the city list to the Top 400 cities. Which takes us down to as little as 8,600 domains and provides a slightly more worldly view. Click on the map below to see the dynamic version. Considering that there are so many people with domains hosted with a third party, e.g. GoDaddy, what does this data actually mean? Well, it still means that the domains are hosted in those places. The data is not based on who the domain's registrar is, but rather where the domain is hosted. GoDaddy doesn't only do domain registration, but also offers hosting. So, depending on where GoDaddy's hosting servers are (there may be one location or multiple locations in multiple cities, who knows), their location is what is represented here.